Scars, unfortunately, are virtually inevitable whenever the skin has trauma, be it by accident or by design, as occurs during childbirth, bouts of acne or even surgery. The healing process begins with inflammation, which stimulates the production of collagen, a fibrous protein that connects and supports the body's tissues. It's this collagen production that produces a scar. Scar types include keloid (an overgrowth of tissue at the site of a healed skin injury), stretch marks, hypertrophic (raised scars), and atrophic (depressed scars). How your skin scars depends on a number of factors including the depth and size of the wound or incision, where it's located, your age, genetics, gender, ethnicity, and scarring history. Scars often become less noticeable with time, but they never disappear entirely. They can, however, be made less obvious through a variety of options: over-the-counter or prescription topical creams, ointments, and gels; injections; lasers; microneedling and surgical scar removal or revision. Often times a variety of treatments are suggested for fastest results such as a cream and a laser treatment and/or microneedling treatments. 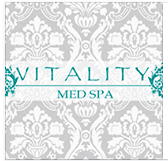 Vitality Med Spa and Plastic Surgery Center offer the removal of scars resulting from cuts, burns, bites, accidents, surgery, stretch marks, and acne. Some treatment options work best with a particular type of scar. Performed under local anesthesia, scar treatment is done as an outpatient procedure. The regeneration process begins as early as 4 days after treatment, and as it progresses the scar's appearance is minimized by between 50% and 80% after the first visit with most scars. Scar treatment also lessens the chance that the scar recurs, reduces redness, flattens scars, resurfaces the skin, and promotes collagen growth and the body's natural healing process. Lasers of various wavelengths and intensity and microneedling can be used to recontour scar tissue and reduce redness around healed lesions. The type of laser used is determined by the results sought. For example, fractional erbium laser treats areas of discoloration close to the surface and penetrate deeper into the dermis to eliminate damaged cells and stimulate new collagen growth. The new collagen lifts and supports the skin's surface, improving its texture and the appearance of the scars. The number of treatments (usually between 1 and 4) depends on the depth of the scars. Post-treatment redness may persist for several days as the healing process occurs. People with darker skin or disorders like psoriasis, acne, and dermatitis may not be candidates for laser scar removal but can use microneedling. Mild scarring can be treated with microdermabrasion, which uses diamond crystals to produce mild abrasion that smoothes out the surface of the skin and removes discolorations, and chemical peels, which generally contain a blend of various acids such as lactic, kojic, glycolic, and salicylic, as well as enzymes and other nutrients that cause the upper levels of the epidermis to slough off in the days following treatment. Peels get rid of damaged skin cells by removing the outer layer of skin to reveal the uncontaminated layer below. Microdermabrasion and chemical peels are often used together on facial tissues. It is also effective for diminishing stretch marks and acne scars. Lastly, cosmetic injectables like Bellafill are FDA approved for scar contouring and can eliminate the appearance of acne scarring permanently. Bellafill is a collagen inducing injectable which is performed in office over a few treatments by one of our Master Level Injectors certified in scar therapy. Please call to schedule your complimentary in office consultation to determine the best treatment plan for you at 678-394-0061 or visit us at www.vitalitymedspamd.com.